Healthy Foods – VeganButter – Don’t Have Time To Make This? No Worries – You Can Now Buy It! Order up your VeganButter here! We’ve shared Miyoko’s video on how she makes a healthier alternative to dairy butter, because we share the same world vision about all sentient beings coexisting on Earth: Animals are sentient beings of intelligence. They deserve to live a natural life in peace, not a life of torture and pain. But, lots of people make the excuse that making Veggie-friendly butter is too much trouble … they don’t have the time … I’d rather take my chances eating real butter … I’m a Vegetarian, but I don’t care whether my butter is dairy … I don’t wanna hear how the cows are treated … Really? Well, it’s here. What you didn’t even know you were waiting for … and it’s hitting Whole Foods shelves in several regions this week … and it tastes great! The bonus? Your arteries will thank you. Yay, Miyoko!! Get heart-healthy and get with-it … Live Peace! Go Vegetarian! Go Vegan! Live Aloha! This is my interpretation of vegetarian siu mai. The Asian dumplings are often filled with meat, so this is my attempt to create a toothsome, equally flavorful appetizer without meat. To do so, I prepared and filled the siu mai pockets with bean curd, jicama, shiitake, wood ear mushrooms, green onions, rice wine, soy sauce and sesame oil.Shaping dumplings with a vegetarian filling while preventing them from collapsing once they were steamed was a bit challenging. I used silicon mini muffin liners to avoid a possible culinary disaster and keep them appealing. Sometimes, thinking outside the box can be a life-saver for the home cook that I am! Panzanella is an Italian dish that is traditionally made with day old bread. It is a great summer recipe because it uses delicious, fresh summer produce like tomatoes and cucumbers. This depends on the size of the leaves, I used 30 medium leaves. 1. Combine the garlic, red wine vinegar and mustard into a bowl, whisk in the olive oil. Then add the salt and pepper. Do a taste test and decide if you want to add more salt or pepper. 2. Cut the cucumber long ways and remove the seeds. Then cut it into bite size pieces. Place into a large bowl. 3. Remove the core of the tomato and quarter it. Remove the seeds. Dice the tomato and and add it to the bowl with the cucumbers. 4. Chiffonade your basil but do thicker slices then you normally would. (To chiffonade, stack several basil leaves and roll them into a tight roll, slice them starting at one end. Normally you would do thin “little” ribbons which is what chiffonade means but, in this case, I sliced my ribbons thicker). Add it to the tomato and cucumbers. 5. Slice the red onion into thin slices. Add them into the bowl along with another teaspoon of Kosher salt and the vinaigrette. Stir. 6. Cover the bowl and refrigerate for 2-3 hours. 7. Remove from the refrigerator and add the croutons and day old bread. Stir. Allow this to set for 30 minutes to an hour before serving. Banana Sundae ~ If you want info about this challenge and the shopping list, click on the image. Is there anything more decadent than a warm, chocolate sauce drizzled over cool, sweet, creamy ice cream? Today’s dessert is going to have you licking your bowl clean – and don’t worry, we won’t tell anyone. The sauce for this recipe is super fudgy and will have you forgetting all about the sugar and chemical filled chocolate sauces of your past. And you may even discover that you enjoy the way banana ice cream makes you feel so much more than the way regular ice cream makes you feel, that you make it a permanent fixture in your life! When I was first transitioning towards a whole food diet, I actually ate banana ice cream with a different sauce every night for about six months, and never got tired of it! I am sure that you are going to love it was much as I do. 1. Place two frozen bananas in a blender or food processor and blend until it reaches a creamy ice cream texture. Transfer to a bowl and allow to set in the freezer while you make fudge sauce. 2. Place cacao or cocoa or carob powder, coconut or cacao butter, maple syrup, salt and vanilla into a blender and blend until smooth. The friction from the blending should heat your sauce. 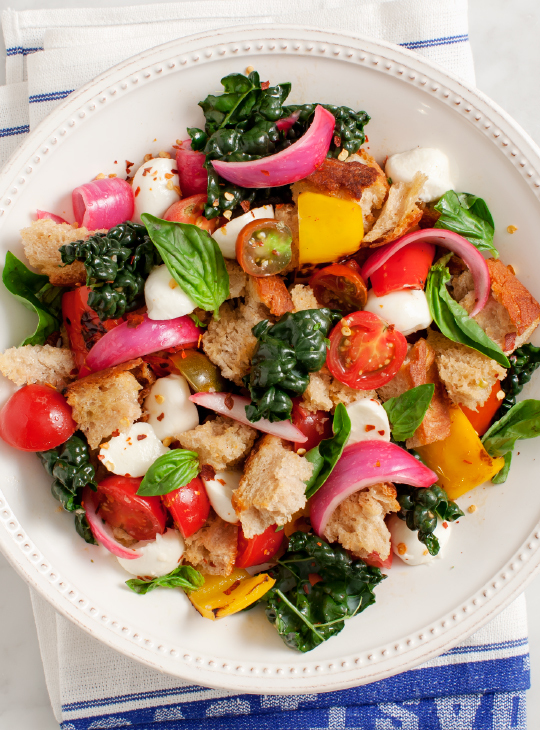 Panzanella: it’s your excuse to eat bread and call it salad! For the pickled onions: (make in advance) pickle your onions by shaking all ingredients together in a jar. Chill until for at least an hour, or up to days (or weeks, really) in advance. Slice cherry tomatoes and toss them with a splash of olive oil, a splash of sherry vinegar, salt, pepper. Drizzle olive oil on your stale bread and toast (or grill) it until golden. While it’s still warm, rub it with a sliced clove of garlic, then slice it into bite sized pieces. De-seed and slice your peppers into thick strips. Sautée them in a pan with olive oil until soft and lightly blistered. (you could also do this on a grill). Remove from heat, drizzle with a little sherry vinegar and a pinch of paprika. Toss all salad ingredients together so that the juices from the tomatoes and the peppers create a light dressing. Drizzle with a little more olive oil. Taste, and add more salt and pepper to your liking. Let it sit for at least 10 minutes or so for the bread to soak up the juices. Serve at room temp. Instead of pickled onions, you can also cook onions with your peppers. Use a yellow onion instead of a red one. 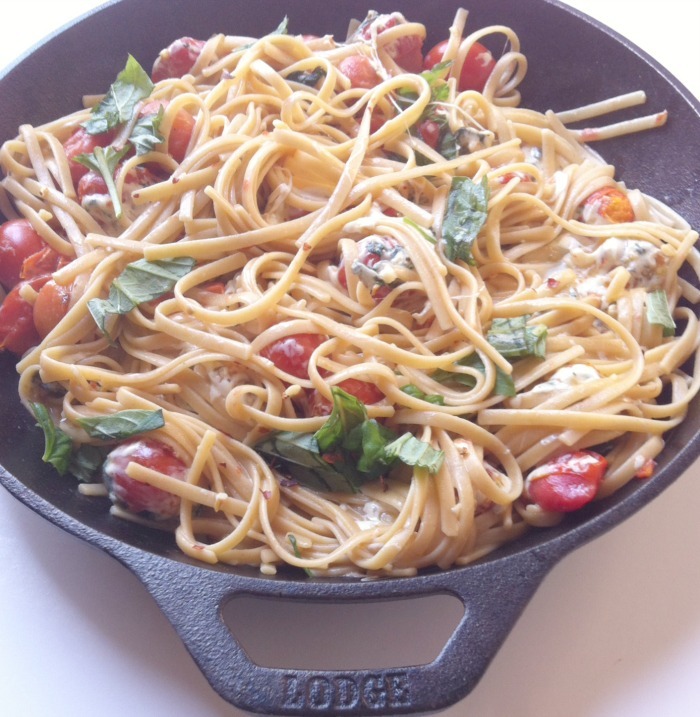 Caprese Pasta Skillet mixes fresh basil, cherry tomatoes, pasta and mozzarella to make a quick 30 minute meal that the whole family will love. Perfect dish to use up your summer garden tomatoes and basil! Cook pasta according to box, drain water reserving ½ cup of the pasta water when done and set aside. In a large skillet heat the 6 Tablespoons olive oil and saute the tomatoes for two minutes. Add the garlic and oregano. Continue sauteing until the tomatoes are soft. Add in the reserved pasta water and simmer for an additional 1 minute stirring to combine. Add the pasta, basil and mozzarella and heat on low stirring until the cheese is melted, about 2-3 minutes. Add salt and pepper to taste and crushed red pepper flakes (optional). Serve warm garnished with fresh chopped basil. Notes: Add grilled chicken to add protein to this dish. Drain and mash the tofu. Wash and prepare all the vegetables. Lightly beat the egg with the salt and pepper. Combine the mashed tofu and vegetables with the egg and seasonings.Heat the oil for deep-frying while you are wrapping the wontons. 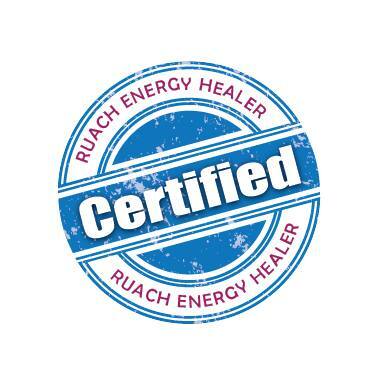 The oil should be heated to between 360 and 375 degrees Fahrenheit. To fill the wontons, lay a wrapper in front of you so that it forms a diamond shape. Wet all the edges of the wrapper with water. Place a teaspoon of filling in the middle. Bring the top half of the wrapper over the filling and seal the edges. Deep-fry the wontons until they are golden and crispy (about 2 minutes). Serve with hoisin sauce or soy sauce. Preheat oven to 200 C (about 400 Fahrenheit). Toss beetroot in oil. Place on a baking tray and roast for 30-40 minutes until tender. Meanwhile, grate the cauliflower on the larger side of a cheese grater, or pulse in a food processor until it’s rice sized. Wrap the riced cauliflower in a couple of paper towels and squeeze to remove any excess moisture. Heat oil in a medium saucepan over medium heat. Add onion and cook stirring for 5 minutes until soft. Add garlic and cook for a further 2 minutes. Add wine and bring to boil. Add cauliflower rice and stock. Cook until liquid is almost absorbed. Add beetroot chunks. Cook until heated through. Stir through walnuts, Parmesan and rocket. Divide between a plate and a lunchbox. 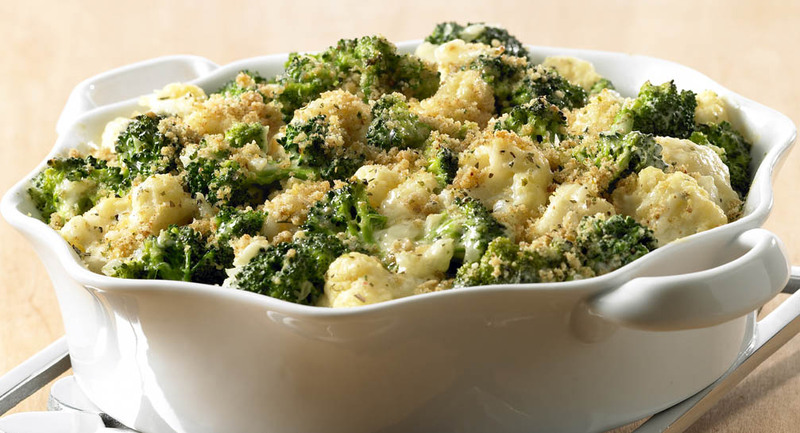 Serve with flaked Parmesan and cracked black pepper.